Prior imaging studies of scoliosis patients attempted to demonstrate a relationship between plain radiographic curve patterns and curve progression and pain, or used magnetic resonance imaging (MRI) to focus on spinal cord abnormalities. Pain in scoliosis patients may differ from nondeformity patients, yet may still be discogenic. The purpose of this study was to assess the possible relationship of degenerative disc findings on MRI to scoliosis patients’ pain. This prospective study enrolled scoliosis and control patients, all of whom had assessment for back pain (visual analog scale) and disability (Oswestry Index) and spinal MRI to identify prevalence and distribution of degenerative disc findings. 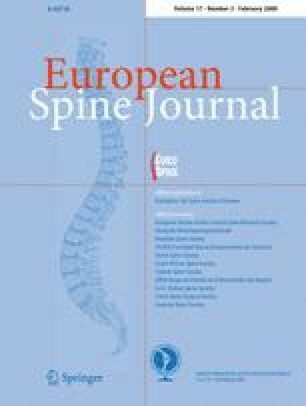 Specifically, we assessed 60 consecutive pediatric and adult idiopathic scoliosis patients who had progressed to surgical treatment, 60 age- and gender-matched asymptomatic controls, and 172 nondeformity symptomatic degenerative disc disease patients who had progressed to surgical treatment. All subjects had independent analysis of their preoperative MRI for disc degeneration, disc herniation, Schmorl’s nodes, and inflammatory end plate changes. Imaging findings of the scoliosis patients were compared to those from asymptomatic and symptomatic control groups. Our results found that both pediatric and adult scoliosis patients had significantly more pain and disability than did asymptomatic controls (P < 0.001). The adult idiopathic scoliosis patients had pain and disability similar to those of surgical degenerative disc disease control groups. Disc degeneration and herniation (contained) were not related to pain. However, in the pediatric scoliosis patients, those with Schmorl’s nodes often had greater pain than those without (P = 0.01). Adults with painful scoliosis, typically occurring at the apex of the scoliosis or at the lumbosacral junction, had a significantly higher frequency of inflammatory end plate changes on MRI than did controls (P < 0.001). Prior studies have demonstrated a correlation of inflammatory end plate changes to lumbar discogenic pain. In conclusions, scoliosis patients who have progressed to surgical intervention, pediatric patients have varying degrees of pain, and those with Schmorl’s nodes may be at greater risk for pain. Adult scoliosis patients have multifactorial pain of which one component may be related to degeneration of the lower lumbar discs similar to that in nondeformity patients. Additionally, adult scoliosis patients may have MRI findings consistent with discogenic pain at the apex of their curvature, most commonly at the proximal lumbar levels.